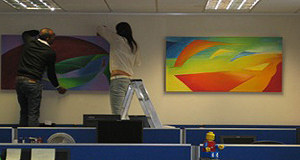 Rent or buy paintings for the office directly from the artist. I provide a personal service All of my art is original and unique. I will deliver free and help with the hanging if you wish. London, Surrey, Dorset and Hampshire are an easy reach for me but I can supply the artwork anywhere in the UK. It is simple and hassle free. I deliver them, collect them and rotate them as you wish. If you want to buy a piece you can. 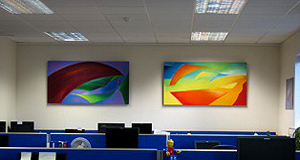 Office Paintings really do impress visitors particularly if the artwork is original and engaging. Your employees will love them too. It is important to make the right choice and to keep them "fresh" I can help with that. Choose from a wide variety of art, large canvasses, watercolours acrylics are all available. 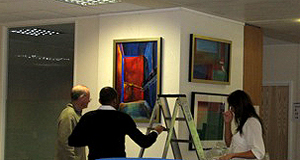 The paintings are tastefull vibrant abstract paintings that are all original. For open plan, lobbies and individual offices. Sizes vary from 5 feet across to 2 feet across. Refreshes, uplifts and vitalises the place we spend more time in than our home! The staff were delighted and management enjoy them too, and report a boost to morale. Good for everyone. Hospitals, Restaurants, Universities, Colleges, and Estate Agents are amongst my outlets.